Foods and beverages. Certain foods and beverages stain our teeth, like curries, soy sauce, berries, black tea, coffee, red wines, colas and red fruit juices. Tobacco (picture 3). All sources of tobacco (Cigarettes, cigars, pipes and chew) will stain our teeth, making them into a nasty shade of yellow. Other than that, it will also cause bad breath (also known as halitosis) and cause bone resorption as well as loosening of the teeth. 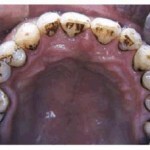 Certain chemicals and drugs can discolour the teeth, such as fluoride, tetracycline, and derivatives of tetracycline e.g. minocycline and doxycycline. Fluoride is essentially good for our teeth, and is needed to prevent decay of the teeth. However, with excessive intake of fluoride, fluorosis can occur and this gives our teeth a white speckled and brownish appearance. 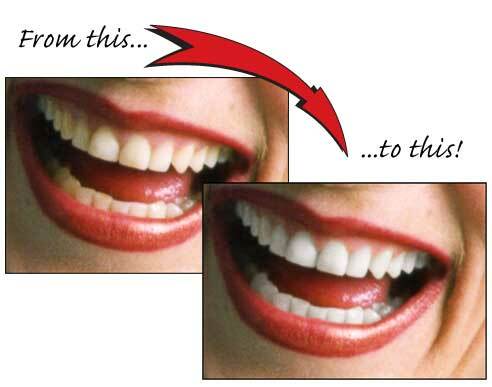 The first tip to having a whiter and brighter smile is to sensibly avoid all the extrinsic stains. However, it is not possible to totally make do without beverages like coffee or tea, therefore, after every intake of those elements that can stain your teeth, remember to rinse your mouth thoroughly. This will eliminate or at least decrease the concentration of staining substance in your mouth. 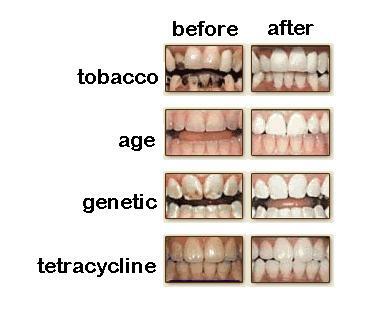 Replace the drugs that are causing tooth staining if you are taking them. Consult your doctor and tell them the problem you are facing, and they will change your prescription for you. Secondly, u can try using the baking soda like a toothpaste to brush your teeth. Use it once or twice a week until you get the effect desired. Some people are against this idea as baking soda has a gritty feel to it, but that is what that makes baking soda an effective tooth whitening agent. Manufacturers often add abrasive substance into toothpaste too, this is to rub away the stains on the surface of the teeth. Baking soda acts as the abrasive substance in toothpaste, however, as it is more gritty, there should not be excessive use. The insides of the banana peel can also be used to rub against the teeth in a circular motion. A ripe banana is more preferred as they contain high contents of potassium, magnesium and manganese. Furthurmore, it is not abrasive, therefore, it does not harm the tooth surface. This can be carried out either before brushing the teeth or after, and is rubbed for 2 minutes twice daily. Eating more fruits and vegetables can also cleanse the teeth surface as they are fibrous, and they will scrub the teeth as you chew. The more popular choices are apples, pears, grapes, carrots, spinach, broccoli, lettuce and celery. Hydrogen peroxide mixed with water can be used as a mouthwash to whiten teeth. It can also be added into the baking soda mixture and be used as a toothpaste. Commercial tooth whitening kit and whitening toothpaste also contains hydrogen peroxide. 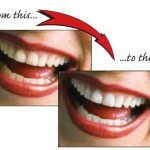 A trip to the dentist for tooth bleaching can whiten your teeth considerably. This can be done in various methods, however, the downside to this is that it does not come cheap. If it is only one tooth which is discoloured, your dentist is able to replace your stained tooth with veneers or crowns. But this option has to be discussed thoroughly as it has its own downsides. Internal bleaching can be done in root canal treated tooth which is discoloured. Flossing regularly to remove any food debris stuck between our teeth can also help to maintain our pearly whites. 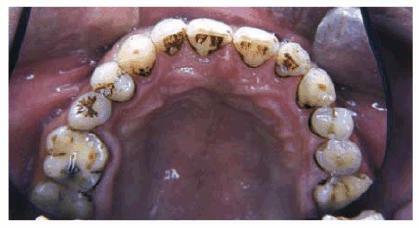 Food debris causes plaque buildup, which will result in stained teeth if not removed. Intrinsic stains are harder to come off compared to extrinsic stains, so do not get frustrated and give up if the results are slow. 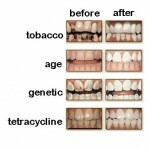 Despite all the whitening effects taken, always remember to maintain a good oral hygiene and stay away from tobacco to get a bright, shiny smile. Do consult a dentist and stop whatever steps taken if there is any sensitivity. This entry was posted in Oral Care and tagged baking soda, extrinsic factors, Hydrogen peroxide, internal bleaching, intrinsic factors, stained, tetracycline, whitening kit, whitening toothpaste on March 3, 2011 by chzechze.